Free shipping. Buy direct from HP. 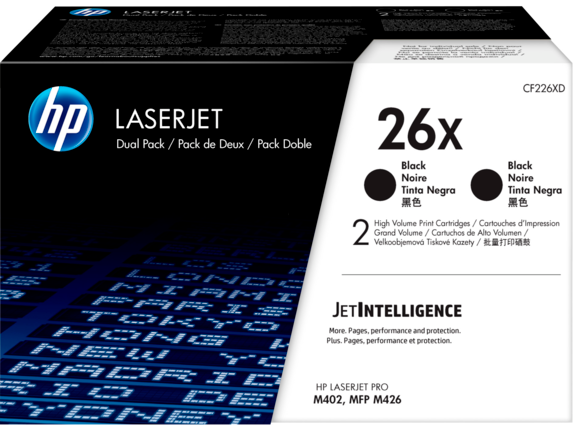 See customer reviews and comparisons for the HP 26X 2-pack High Yield Black Original LaserJet Toner Cartridges. Upgrades and savings on select products. Original HP Toner cartridges with JetIntelligence help you get the most out of your printer—professional documents you can proud of, more pages at fast speeds,[1,2] and anti-fraud technology. Relish consistent quality at high speeds with Original HP Toner cartridges with JetIntelligence.Produce sharp text, bold blacks, and crisp graphics with precision black toner.Keep energy use down—Original HP Toner cartridges with JetIntelligence help your HP printer consume less. Help ensure you’re getting the authentic HP quality you paid for with innovative anti-fraud technology.Help manage costs, decrease help desk calls, and plan on consistent professional-quality printing results. Precision black toner helps your business look sharp by producing crisp, black text and professional-quality graphics.No delays or mess—quickly replace your cartridges, using auto seal removal and easy-open packaging.Spend less time on problems. Original HP Toner cartridges are designed to work with HP printers. Manage your investment. Page maximizer technology delivers more pages per cartridge than before.Intelligently track toner levels with print gauge technology to help ensure you get the pages you paid for.Print more pages and replace cartridges less often with optional Original HP High Yield Toner cartridges.Print more pages and replace cartridges less often with optional Original HP High Yield Toner cartridges. 1 LaserJet Original Toner cartridges with JetIntelligence released after 2015. Highest capacity cartridges compared to predecessor highest capacity toner cartridges. For more information, see http://www.hp.com/go/learnaboutsupplies. 2 HP 26X High Yield Black Original LaserJet Toner Cartridges are not included in printer purchase; Please purchase separately. Learn more at http://www.hp.com/go/learnaboutsupplies. 3 As compared with cartridge gauges for predecessor products. 4 Approximate average yield based on ISO/IEC 19752. Actual yield varies considerably based on content of printed pages and other factors. For details, see http://www.hp.com/go/learnaboutsupplies. 5 Based on cartridge yields for HP 26A compared with HP 26X Original HP toner cartridges. For more information, see http://www.hp.com/go/learnaboutsupplies. 1 LaserJet Original Toner cartridges with JetIntelligence released after 2015. Highest capacity cartridges compared to predecessor highest capacity toner cartridges. For more information, see http://www.hp.com/go/learnaboutsupplies. 2 HP 26X High Yield Black Original LaserJet Toner Cartridges are not included in printer purchase; Please purchase separately. Learn more at http://www.hp.com/go/learnaboutsupplies.